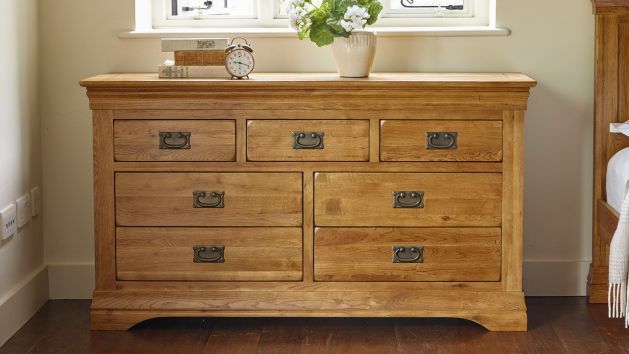 Add storage and style to your bedroom with our wide range of solid oak chests. Boasting dovetail joints on all drawers and our rustic and natural finishes. Our extensive collection of oak chests of drawers combines the best in high quality construction with carefully considered style. Using both our natural and rustic wax finishes to give each piece its own look, we have created chests which span traditional to modern styles. These units are available in a wide range of styles. We have wide units, ideal for the bedroom, featuring up to 7 drawers with real dovetail joints for durability and style. Tallboys are excellent slim pieces that work in compact spaces, such as hallways and home offices to create handy storage. We carefully select only the best materials for our products. All backs, as well as drawer bases and runners are made from solid oak so that they don't bend or bow. A-grade timbers are used, and hardware is carefully chosen to complement the look of each piece. Browse our chest of drawer selection below and get inspired!